On October 19th, European Union marked the EU Anti-Trafficking Day. As the European Union inches closer to adopting a treaty that could, among other things, increase the EU's anti-trafficking work, it makes sense to consider the reality of trafficking in the EU as well as the EU's role in addressing trafficking as a supranational entity. According to an article in the AFP, "the United Nations said on Sunday [October 18th] there could be around 270,000 victims of human trafficking in the European Union and urged greater efforts to combat the illegal trade." The article goes on to report that "Authorities in Europe were aware of only a tiny proportion of the victims, said the UN Office on Drugs and Crime (UNODC), estimating there were 30 times more people affected than were known about. 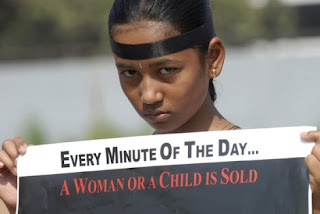 "Human trafficking is also extremely underprosectued in Europe, according to the United Nations. Bernama.com cites a "report by the Press Trust of India (PTI) [on a] study that finds that fewer people are convicted for human trafficking in Europe than for less-frequent crimes like kidnapping." While such incredible disparities between the number of victims and the number of victims identified are a universal norm around the world, action at the EU level is vital for effectively combating slavery in Europe. Near the end of October, the Organization for Security and Cooperation in Europe (OSCE) Special Representative for Combating Trafficking in Human Beings, Eva Biaudet, and the Director of the OSCE Office for Democratic Institutions and Human Rights, Ambassador Janez Lenarcic issued a statement underscoring the importance of the EU in addressing trafficking. A press release from the OSCE quotes Biaudet as saying "Fighting trafficking means having zero tolerance towards exploitation, particularly exploitation of women and children. . .If we fail to combat the increased tolerance of exploitation, the effects of the global crisis will be felt in our socio-economic development for decades to come." The statement highlights different EU-level policies and programs that have a role in combating slavery. The report also addresses the role of the economic crisis in increasing the number of people vulnerable to trafficking, pointing to the EU's role in economic development and immigration policy, both of which impact people's vulnerability to trafficking situation. They applaud the EC Proposal for a Council Framework Decision on preventing and combating trafficking in human beings, and protecting victims for its efforts to establish an EU-level policy that focuses on victims' needs, while addressing prevention and prosecution. to collect and collate best practices and concrete proposals for action against trafficking in partnership between the ERU and third countries." In her welcome statement to the conference, Beatrice Ask, Minister for Justice, stated "But the work done so far is not enough. We need to broaden our approach. The main purpose of this conference is to strengthen the co-operation between government administrations, international institutions and NGOs in countries of origin, transit and destination. There is a mutual dependence between us in order to effectively fight and prevent trafficking in human beings. We have to work together, and we need to step up our efforts." Minister Ask's words are applicable to all of us involved in working to end modern-day slavery.